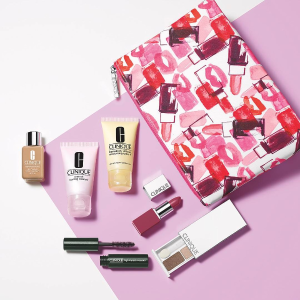 Bloomingdales offers FREE 7-PIECE GIFT($100 value) with any $29 Clinique purchase. Plus, Spend $55, choose two more gifts. Plus, Spend $75, get a free tote and deluxe Chubby Stick in Super Strawberry. Loyallists member get free shipping and free return. Receive a 7-piece gift with any $29 Clinique purchase (a $100 value). - 7 Day Scrub Cream Rinse-Off Formula, 0.24 oz. - All About™ Eyes, 0.24 oz. - Pretty Easy Liquid Eyelining Pen in Black, 0.01 oz. - Chubby Stick Intense™ Moisturizing Lip Colour Balm in Super Strawberry, 0.04 oz. - High Impact™ Mascara in Black, 0.12 oz. - Moisture Surge Overnight Mask, 2.5 oz. Clinique Moisture Surge Intense Skin Fortifying Hydrator 2.5 oz.